The Pioneers finally played a full 60 minutes of hockey. On this night, there were no quick goals given up by the opposition. There were no periodic defensive breakdowns. There was only a solid, dominating effort for 3 full periods. The previous three games for the Pioneers were marked by early goals by the opposition. Tonight, it was the complete opposite. Even though Michigan State won the opening face-off, it only took 1:19 for the Pios to notch the game's first marker. On a Blake Hillman slap shot from above the left circle, Matt Marcinew successfully deflected the puck past Spartan goalie Jake Hildebrand to give the Pioneers an early lead. The Pioneers never looked back. In the first period, they outshot Michigan State 13-5. Denver started even faster in the second period. At the 0:55 mark, from the left corner, Jarid Lukosevicius found Matt Marcinew in the low slot with an absolutely beautiful pass and Marcinew just had to tap the past Hildebrand to double the lead. The rest of the period progressed exactly as the first period did and the Pios outshot the Spartans 13-6. 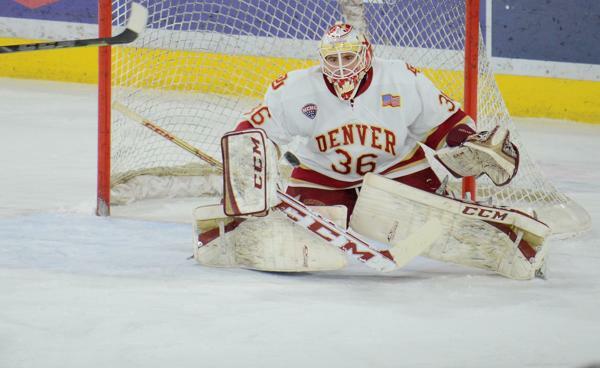 In the third period, it seemed like it took forever for the Pios to find the back of the net again. At the 3:24 mark of the period, after Grant Arnold was denied by Hildebrand on the doorstep, Lukosevicius followed right behind him to tap the rebound over the line and into the net to add another insurance goal and give the Pios the 3-0 lead. That was it for the night's scoring. Despite the Pioneers' best efforts throughout the night, Jake Hildebrand impressively kept the Spartans' deficit respectable. Even with the game well in hand, Denver kept trying to add to its lead with 15 third period shots. Though one of the key storylines of the night was the first shutout of the year and a great bounce-back effort from Tanner Jaillet, the top story of the night was that this hockey team finally started to look like the top 5 college hockey team it is. Coming into the evening, the Pioneers had to come from behind in three straight games after starting slow and giving up very early goals. That worrisome narrative was shattered to pieces against the Spartans on Saturday night. Denver kept the pressure on Michigan State for the full 60 minutes. Many fans were beginning to become concerned that this team was going to make a habit out of starting slow and spotting the opposition an early goal. These fans knew that while that won't come back to bite the team against non-conference opponents like Air Force and Michigan State, it certainly would be a problem once conference play gets here. Tonight's game was so much more than just a shutout victory over a weaker opponent. It was a much needed early "statement" victory. The team needed to prove that it was not the same team that fans saw through the first three regular season games. That's certainly what it did on Saturday night. Michigan State is going back to East Lansing with a sour taste in their mouths and Denver is celebrating their first weekend sweep of the season, just like the Pios drew it up. Marcinew notched his 2nd and 3rd goals of the season; Arnold also had an assist on Marcinew's first period goal; Jaillet earned his first shutout (16 saves on 16 shots) of the year after surrendering 5 goals at Air Force last weekend; After scoring his first two points of the season on Friday, Logan O'Connor started the game; Both teams went the entire weekend without a power play goal; Spartan goalie continued to impress saving 38 of 41 shots for a .927 SV%; Lukosevicius notched his first career collegiate assist and goal for a 2 point game. This was such a solid DU win, it was almost boring. The Pios were in complete control of the game all the way through, and shots on goal were something like 40-16. Great to see DU getting scoring from Matt Marcinew, who had two tonight, and Jarid Lukosevicius added his first college goal. Secondary scoring is the key to being a good team. and DU is getting contributions from all over the lineup. If there is a concern, it is that DU isn't getting much from it's big guns right now- Heinen, Moore and Q Shore, and the power play is poor. If DU wants to beat schools like BC and BU on the road in two weeks, the Pios will need to find a way to get it's big scorers to score. It was so nice seeing a non typical opponent in the building. Next on my bucket list, is U of M. Someday, regular season, I want to see the Wolverines in Denver. And maybe PSU...the team that triggered the realignment. .... lets see how bad the B1G is. Bring it. This ain't football folks. We play big boy hockey out here.....as Sparty just found out. Michigan hasn't played at DU since 1981. Red Berenson won't bring them here. Harvard is another team that hasn't played DU in Denver in a long time - 1954 I think.